Due to my heavy university workload it feels like an age since I’ve been able to write anything for the column; however, to redress the balance, I’m giving you a concentrated hit of what is hip and groovy (probably not) over at the House of Ideas at the moment. That’s right, folks – not one, not two but THREE reviews in one! Never let it be said that Adam X. Smith is lazy when it comes to the reviewing business. First up, Deadpool #20. This almost didn’t make the cut, because after the previous arc wound down in an uncharacteristically ponderous manner, and after a middling “annual” issue last week (clearly that word means something different to you bloody colonials, but whatever), I’ve found myself pretty much Deadpooled up. This must be how Batman fans feel after a few months of consistently reading. What a treat then for writers Brian Posehn and Gerry Duggan, with the aid of artist Scott Koblish, to drop the heavy matters of the last arc in favour of a crazy flashback issue that dumps Wade Wilson in Wakanda following a mission with Cable and having a mission of cosmic import thrust upon him. The twist? The whole thing is written, drawn and presented in the style of Jack Kirby and Stan Lee’s classic Silver Age stories, complete with four-colour art, mystical McGuffin, spacey-wacey plot logic, Kirby Dots and cameos from the likes of The Thing, Mangog, Fin Fang Foom, Odin and Uatu the Watcher (more on him in a moment). So yes, it’s a filler issue, but that’s fine – sometimes taking a breath after having to digest such a heavy preceding story (and The Good, The Bad and The Ugly was nothing if not heavy) is not only necessary but welcome. It feels as though those involved decided to just do their very best to write the funniest, most visually interesting loving pastiche of the Silver Age that they could, and it shows on the page. And God bless ‘em for it. Excelsior. If I’m officially Deadpooled up, then Nova is something I think I could maybe stand to see a bit more of. Wait, don’t go – yes, I know, everyone hates Nova. Yes, I know it’s a sort of a big rip-off of Green Lantern. Yes, I know everyone seems to have this irrational spite going for Jeph Loeb’s work since he left DC. But you know what? 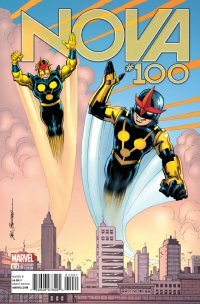 Based on Nova #10 – sorry Nova #100 (both are technically true) – it’s not as bad as all that. 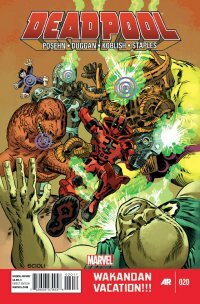 And while Deadpool #20 is an annual issue in all but name and length, this has three great stories (one written by Zeb Wells, two by Gerry Duggan) which spotlight the character brilliantly. First we get the tenth “chapter” in Sam Alexander’s continuing story of chafing against the restrictions placed on him by his mother, and running off to the moon where Uata (told ya we’d get back to him) teaches him a valuable lesson. The second involves him engaging in some outside-of-school galactic adventuring, only for it to have an unexpected effect upon when he rushes back to Earth in time for school only to be stricken blind. And finally, the reason I bought the comic in the first place: a two-page back-up story with art by Yale Stewart of JL8 fame presenting a faux sneak peek at Nova #1000 – a charming story that I won’t spoil but proves yet again that Stewart is a master of the short-form comic world. I could stand to see a lot more long-form material from him if only it didn’t cut into his (admittedly unpaid) work on JL8. And finally, Inhumanity #1 by Matt Fraction and Olivier Coipel. Well, this is generally why I don’t do event comics – it usually relies on you having an exhaustive back catalogue or incredible patience. 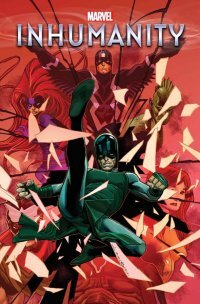 However, for those of us not familiar with the wider backstory of the Imhumans (I wasn’t), haven’t followed the events of the Infinity crossover (I didn’t) or are planning on picking up the imminent ongoing series Inhuman (ech, maybe), this first issue does a decent enough job of recapping said crossover’s effect on the Inhuman population, which to my eyes seems to be a sort of bizarre inverted-House of M scenario: a handful of key characters dead, but with the promise of many more to come. So yeah, three issues, all quite literally crammed to the gills with characters and concepts and cosmic shenanigans. It’s beginning to look a lot like Christmas. The post Man of Steel landscape has been an interesting time for Superman fandom. For one, the film has created something of a schism in the fandom between those who loved or hated it. On the other hand, it’s generated a new set of fans with a certain set of expectations of the character, which puts the future of how the character is perceived in an interesting place, and there’s no telling right now what the endpoint of that is. Of course, the narrative of the past year in comics for Superman can be summed up much more simply by three simple words: not very good. The flagship titles have been beset by very different sets of problems. 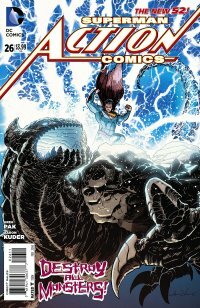 Superman has just not been very good: Scott Lobdell’s scripts have gone for big, quippy cosmic action, but have left character (and often, quality) behind. It could literally be about anyone. Action Comics, since the end of Grant Morrison’s run, has been the poster child for DC’s editorial schizophrenia, seen most clearly in the departure of Andy Diggle from the title after only one issue. After that, Action has coasted between creators, often featuring parts of Scott Lobdell’s Superman run. It hasn’t been all bad, of course. The digital weekly Adventures of Superman is often superlative, and Scott Snyder and Jim Lee’s Superman Unchained hasn’t been bad at all. It isn’t perfect, and doesn’t come close to Snyder’s Batman work, but so far it’s been an intelligent examination of Superman as a symbol. But as a fan, I want to spend time with that guy, and the best Superman material over the past year or two has been so concerned with semiotics that the character seems to have taken an extended vacation. If Greg Pak’s script gets anything right, it’s capturing the identity of Superman. But Pak gets a lot else right, too, so much so that I was surprised, especially coming on the heels of Batman/Superman and the previous issue of this series which were… fine. Just fine. But this month’s Action is actually really, really good. We’ve got a kickass new version of Lana Lang, a whole slew of seeds for interesting stories (including what appears to be a new villain), and a gonzo monster fight. Which is all great, but seeing Superman react to Lana here, and seeing how he chooses to resolve this issue’s conflict just feels right. In a year and change where DC’s seen fit to stress the power levels of this “new” Superman, we haven’t seen very many stories with that all important human touch, the element that makes Superman stories so hard to get right. In the pages of Action, Pak clearly gets that element. Aaron Kruder’s art is pretty much perfect for the kind of story that unfolds here. His monster design and action choreography are top notch, but what I like most are his faces. This may throw some people off, but he switches how he renders faces between more realistic phases and more cartoonish ones depending on the moment. I think that this really works, as he can crank up the intensity with some Herge/Tezuka cartoonishness and then dial it back to express some tenderer sentiments that might otherwise be lost. Kuder’s work on Action blends the bigness of superhero action with a more intimate indie sensibility, and it really brings out the best in this story. OK, Adam, my friend, two can play at this game! 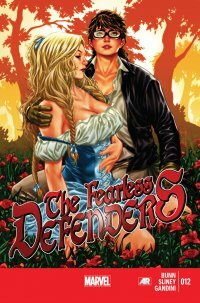 Here’s a look at three more of this week’s Marvel titles, two of which are linked by the time of year, and the third which is linked… well, because I read it, too, I guess. 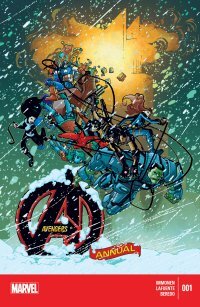 I suppose there’s someone in the Marvel-by-way-of-Disney marketing department that could tell me how a comic comes to be designated an “Annual,” versus, say, a “Special” or “One-shot;” regardless of designation, Avengers Annual #1 (2013) is the sort of thing that makes a nice change of pace for the holidays: a self-contained done-in-one story that leverages the easy charm and occasionally prickly camaraderie that Joss Whedon and company brought to the movieverse Avengers for a Yuletide story with appropriately seasonal lessons about empathy and understanding, as well as some Dickensian shadings of the poignant side of the season. After Shang-Chi finishes taking a group of super-powered youngsters on a Christmas Eve field trip to Avengers mansion, one young girl manages to hide herself away when the others depart, unaware that her unique powers will create a sequence of amusing comic situations, confounding Hawkeye, Stark, Natasha, and the rest; meanwhile, Steve Rogers’ volunteering at a soup kitchen for the evening results in an encounter with a homeless vet that provides a sobering counterpoint, while never detracting from the overall sense of fun. Kathryn Immonen’s script is breezy and funny, and, as usual, she nails the essence of each character in ways that other writers often overlook (when Steve Rogers gets frustrated, instead of the usual “%#$*! !” comic-book convention, our retro-era hero yells “Shoot!” and “Nuts!”). David LaFuente’s fluid, elastic style has always been perfectly suited to Spider-Man, and I don’t know that it would work in a conventional Avengers spandex punchout, but his cartoony work here is the perfect realization of Immonen’s script, and he (or they) manage some great jokes with the Avengers mansion accoutrements (like the “Hellcat Hates Mornings!” coffee mug). This Annual, by whatever name, is a delightful reminder of the sheer entertainment of comics of the Marvel Age. There’s a very different sort of throwback feeling (though a similarly snowbound setting) behind Amazing Spider-Man #700.1, the first of a five-issue miniseries that takes place… well, I’m not entirely sure when it takes place: it’s obviously pre-Superior Spider-Man; as a matter of fact, it seems to be pre-a lot of what’s happened to Spidey over the past few years. Peter Parker’s still alive and still Spider-Man, still works for J. Jonah Jameson at the Daily Bugle, and Aunt May still lives by herself in Forest Hills (it’s like a less moronic version of the Spider-Man newspaper strip). 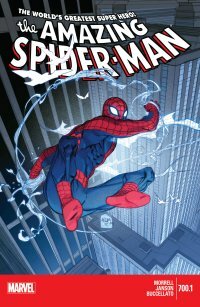 And as much as I’ve enjoyed the shakeup that Superior Spider-Man has brought to the Spidey milieu, I guess there’s a place for a somewhat nostalgic comic, where Spidey continues to occupy his “classic” environment. But that kind of thing takes the veteran instincts of a Kurt Busiek or Mark Waid to make it relevant or interesting; this script, from novelist David Morell (whose dark-toned work includes the novel First Blood that brought us the character of Rambo), is bleak and wintry, with Spider-Man’s greatest challenge coming from a devastating winter storm that has stranded May without power or phone service. It’s a strange bit of storytelling, and much of Peter’s interior monolog has, oddly, some of the same despairing quality of Andrew Garfield’s voiceover in the new trailer for Amazing Spider-Man 2; the only bit of lightness comes from JJJ’s familiar blowhard act. Klaus Janson’s art (with color from Steve Buccellatto) is exemplary, old-school classicism. The story doesn’t seem to have inspired Janson to quite the degree that the recent Daredevil: End of Days clearly did, but he’s still one of the industry’s greats at the top of his game, and a delight to see. I’m really not sure just what Marvel expects this series to accomplish (the preview of the cover to # 700.2 by Pasquel Ferry has a goofy tone quite at odds with this first issue), but Janson makes this a solid recommendation for now; in future issues, we’ll see if Morrel has something more up his sleeve than bad weather. Fearless Defenders #12 doesn’t have any thematic or seasonal relation to Avengers Annual or Amazing Spider- Man 700.1, but I wanted to note the series’ final issue, as the adventures of Marvel’s all-female action team draw to a close. It’s certainly not necessary to have a female author on a comic to realize strong female characters: Kelly Sue DeConnick’s critically-lauded Captain Marvel is matched by hubby Matt Fraction’s treatment of Kate Bishop in Hawkeye, while Kathryn Immonen’s exuberant Sif-focused Journey Into Mystery was a terrific counterpoint to the diverse cast of Kieron Gillen’s Young Avengers. But there was always a sort of tightrope being walked in Cullen Bunn’s Fearless Defenders: it was a book not only featuring an all-female cast, but one that focused on feminist issues that usually felt just beyond the writer’s grasp: Bunn always presented the more “serious” side of his characters with empathy and engagement, but it was really only in the world-saving action beats that the series completely came together; among other things, the mismatched buddy-cop aspect of Misty and Val’s relationship never quite seemed to generate the necessary sparks. And his attempt to explore the notion of a female-female relationship taking place in the same body was even more awkward than Annabelle’s instant infatuation with Valkyrie in the first place. It may not be true to contend, as some have, that “girls don’t read comics.” But it’s also true that the monthly comic buying audience still seems reluctant to buoy worthwhile female-focused superhero comics to that level where readers aren’t constantly expecting cancellation.